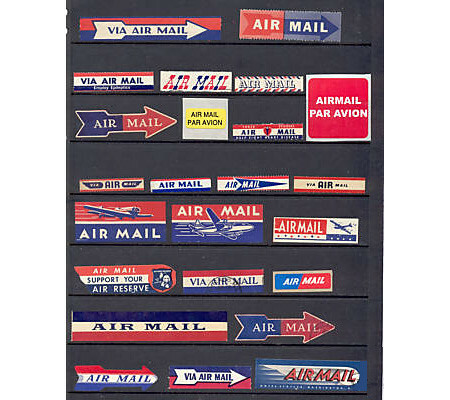 I love the look of these airmail etiquettes. 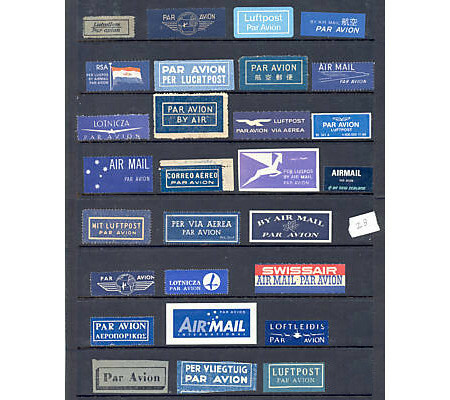 An etiquette (for short) is an adhesive label used to indicate that a letter is to be sent by airmail. I found them on a fantastic blog Hi + Low. She even put a link so you can bid on one of the collections above on ebay. They’re really affordable. I might try to get one. I think they’d look really nice in a white frame with white matte. I’ll post if I win the auction. There are actually a lot on ebay so there will be enough for all of us if you want one too. Do you remember Griffin and Sabine‘s correspondence? 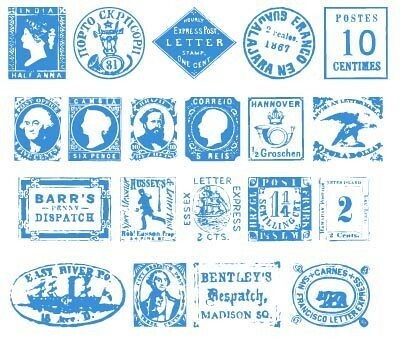 On a diy note, how about this free postage stamp font? I found it on how about orange. Now you can make your own old fashioned looking letters. Here’s a step by step how to make an envelope look vintage: “Craft a vintage fifties letter” via psdtuts.com. If any of you actually do this please show me so I can post it. I met some really incredible bloggers this weekend at a meet-up so look for some posts about their fantastic blogs and work later this week. Have a good one. Enjoy! Oh Laura, the cab was my pleasure. It was such a fun meet up. Such great people doing creative things. 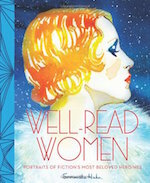 I adore Griffin and Sabine, so cool that you met the author. Thanks for checking out Maquette! I have to really explores everyone’s blogs this week.